Salish Kootenai College Nursing program, established in 1988, leads the nation in graduating Native American Registered Nurses. Individualized education and a supportive learning environment are hallmarks of the Salish Kootenai College Nursing program. In 1998, the nursing program expanded to include an RN-BSN completion program, with the first class graduating in 2000. 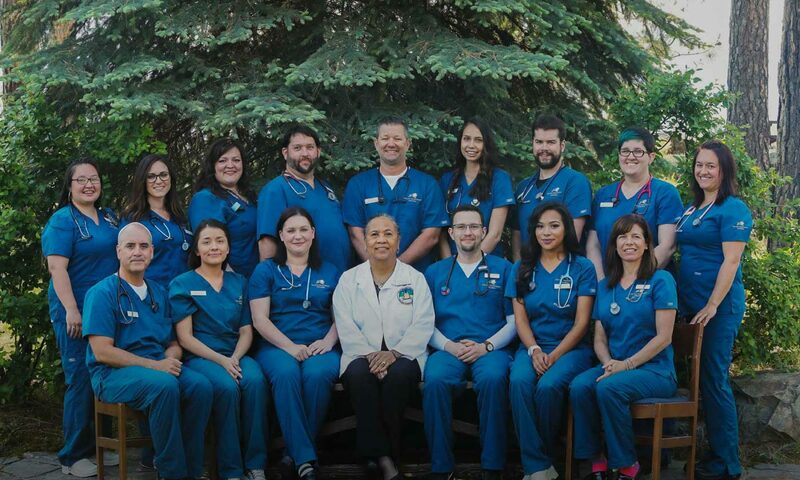 The mission of the SKC Nursing Department is to provide Native American nurses with the competencies required for professional practice and leadership in rural and tribal communities. The Department promotes collaborative partnerships and relationships with individuals and communities to enhance their health, well-being, and cultural identity. Utilize critical thinking and evidence-based interventions to coordinate holistic care. Utilize effective written and verbal communication and information technology to collaborate with health care members, patients and their families. Provide culturally congruent care to reduce health disparities. Demonstrate citizenship, integrity, self-reflection, and life long learning in nursing practice. Utilize critical thinking, nursing theory, and research to support decision making in nursing practice. Incorporate information literacy, effective communication strategies, and analysis of nursing knowledge to provide effective community based care. Provide culturally congruent care to utilize advocacy in improving the effectiveness of health care systems. Demonstrate citizenship, leadership, social consciousness, and commitment to improve the quality of life for Native American and rural communities. The ASN and RN-BSN nursing program curriculum is based on professional nursing standards. The American Association of Colleges of Nursing (AACN) Essentials of Baccalaureate Education, the American Nurses Association (ANA) Scope and Standards of Practice, the ANA Code of Ethics, and the National League for Nursing (NLN) Outcomes and Competencies for Graduates of Baccalaureate Programs in Nursing all inform the curriculum. Communities of interest such as employers and members of professional associations also provide input to the curriculum. Classroom (didactic) and clinical components comprise the ASN and BSN curriculum delivery. The ASN program prepares graduates to provide safe, competent, and culturally congruent nursing care. The BSN program prepares graduates to be nurse leaders, particularly in rural areas and Indian Reservations. The Nursing Program, including both ASN and BSN programs, assesses student learning outcomes using a variety of both direct and indirect measures for both formative as well as summative evaluation purposes. The program incorporates comprehensive projects, exams, quizzes, competency and skill demonstrations, medication calculation exams, Kaplan standardized exams, and specific assignments for direct assessments. Indirect assessments include student exit surveys, Community Advisory Board evaluations, student course evaluations, student faculty evaluations, and NCLEX-RN pass rates. All assessments are based on measuring students’ ability to meet both course student learning outcomes and end-of-program student learning outcomes. The 4 Cs of critical thinking, communication, culture competence, and citizenship inform the metrics associated with achievement of the College’s general education courses, Nursing courses, and the Nursing program. The Nursing Department’s Systematic Plan of Evaluation (SPE) analysis is conducted quarterly, annually, or as needed. Through the SPE process, key components of administration, faculty, students, curriculum, resources, and outcomes are assessed systematically so that changes may be made in a timely manner, therefore contributing to the nimbleness of the program. Additionally, systematic assessments also point out what processes are working well and need to be continued. Critical Thinking is a creative, disciplined, reflective, and self-directed activity leading to a justifiable and rational decision. Critical thinking is a holistic process that incorporates tradition, multiple perspectives and solutions, and diverse ways of knowing, to produce effective client outcomes. Communication is the respectful dynamic process of human interaction that honors individual patterns, multiple ways of interaction, and relationship-based care. Communication through listening, oral, non-verbal, written, and informatics modalities leads to respectful human connections, and effective client outcomes. Culturally Congruent Care begins with the awareness of ones own system of values, beliefs, traditions and history and knowledge and respect for the systems of others. Development of culturally congruent care is the continuous process of integrating knowledge, skills, and attitudes that enhance cross-cultural communication and effective client interactions. Environment, community, and tradition provide the context for respectful adaptation of care that is congruent with client beliefs and values. Citizenship is informed and committed participation in the life of the community through creative and collaborative action at local, national and global levels. Nursing uses ethical and professional frameworks to recognize, and address community issues, role model behaviors that respect the rights of others, provide community service, and advocate toward social justice.